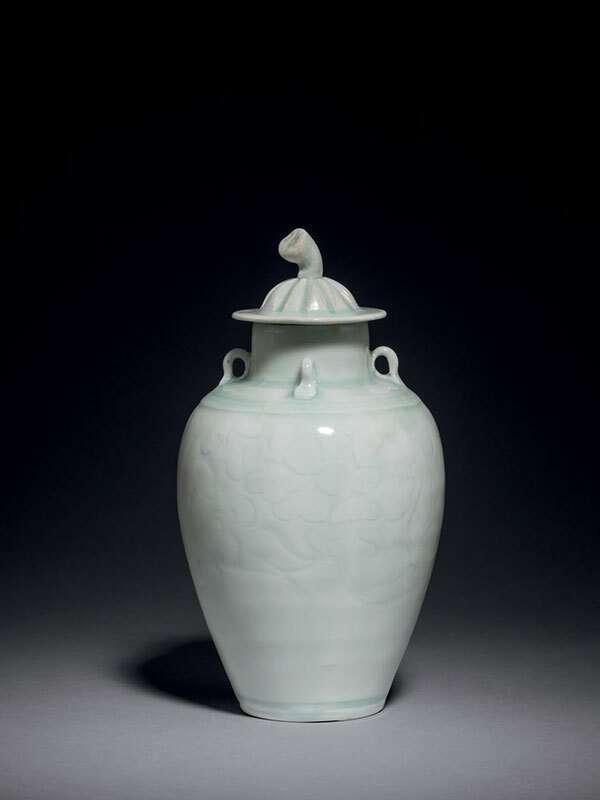 A porcelain vase of baluster shape, the sides rising upwards from a slightly recessed base, curving towards the stepped shoulder and surmounted by a straight neck, around which four small lug handles have been applied. The upper part of the body is decorated with a freely carved design of scrolling flowers, which have combed details to the petals. The cover is of domed shape with a broad, flat rim. The domed part of the cover is moulded with ribs and surmounted by a stalk-shaped finial. The vase is covered in a pale bluish glaze, which pools in the crevasses to an aquamarine tone, forming characteristic ‘tears’ in places. The base is unglazed, exposing the white porcelain body underneath and has characteristic firing marks.